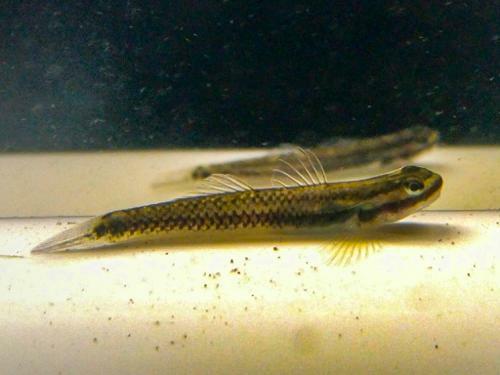 These are not the Blue Belly Goby we are already familiar with from Indonesia. This is a species from China. They are very rare and this is the first time I have heard of them, much less seen them. I don't know anything about them other than they look very similar to the Stiphodon gobies and appear to have the same behavior and feeding habits. They don't appear to be picky and eat pretty much anything as they graze the surfaces in the aquarium in the same manner as Stiphodons, hillstream loaches, etc. Mine especially like Repashy. A good portion of vegetable matter is probably important to their diet. So far, they have proven to be hardy and peaceful. They are currently about 1" long, give or take a bit.